and broil for up to 5 minutes to give them a little bit of a crisp. Be careful not to burn. Looking for something to make with all of your fresh picked zucchini and corn? This vegan chowder is loaded with veggies and a perfect recipe to use up your garden or farmer’s market finds! Heat 1/2 cup of water in large saucepan. Add garlic, onion, celery, carrot, and bell peppers, and thyme and cook until veggies begin to soften. Add potatoes, 4 cups of water, and bay leaf and simmer until about 10 minutes until potatoes start to soften. Add corn, zucchini, and almond milk and cook until all veggies are soft. Season with salt & pepper to taste. It’s chilly today in Indiana so I decided to make soup. I’ve made cauliflower soup before but I was craving mushrooms so I decided to throw some in along with some kale. I also had some leftover cashew cream from my cauliflower eggz benedict so I add some of that too. If you want to save some time, you can leave out the cashew cream, it’s great either way! I think this is my new favorite soup! In a large saucepan, add 1/4 cup of water along with the garlic and onion and saute until soft, about 5 minutes. Add the cauliflower, mushrooms, water, bouillon cubes, and black pepper. Bring to a boil then reduce heat to medium and simmer until cauliflower is soft. Let the soup cool a bit then pour 3/4 of it into a blender and blend until mostly smooth. Transfer back to the saucepan with the remaining 1/4 of the soup and add the chopped kale and cashew cream, if using. Reheat and serve. Place all ingredients in a high-powered blender and blend until smooth. Looking for a great vegan Mac & cheese recipe? 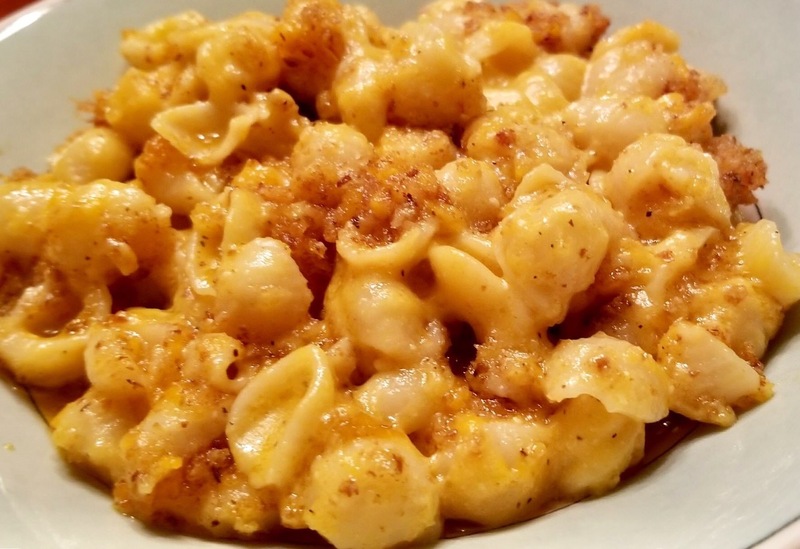 I usually don’t post recipes that call for specialty ingredients such as vegan cheese, but friends have been asking for the macaroni and cheese recipe that turned my husband vegan. I made this recipe a few months ago for the first time using the new So Delicious vegan cheddar cheese and my omnivore parents and vegetarian husband loved it! Later in the day my husband came in from mowing and siad that he had been thinking about it and that he had decided to go vegan. He said there’s enough great vegan cheeses on the market today that he didn’t want to contribute to the milk industry any more! Now, I can’t take ALL the credit. A lot of it goes to these amazing companies offering tasty vegan options. The So Delicious vegan Cheddar is a game changer! I purchase it at Fresh Thyme or Whole Foods. I believe you can also get it online at veganessentials.com. Another great vegan cheese that is used in this mac and cheese recipe is Kite Hill’s ricotta made with almond milk. The taste is amazing and well worth the 2 hour drive to Whole Foods to get some! If you don’t have a Whole Foods nearby you can leave it out. You can make this as a baked mac and cheese by following the full recipe or a creamy mac and cheese by omitting the crumb topping and not baking it. My husband prefers the baked, I prefer the creamy. 4 tablespoons vegan butter. I like Earth Balance. 2 cups rice milk original. Not vanilla. You can use any non-dairy milk like cashew or almond milk but they change the taste and I don’t think they taste as good in recipes like this. Rice milk is preferred. 1/2 cup bread crumbs. Bake 2 pieces of white bread in the oven on 350 for about 10 minutes. Keep an eye on it so it doesn’t burn. Once toasted. Pulse them in a food processor until crumbled. Prepare the macaroni as directed and set aside. Melt the butter in large saucepan over medium heat. Stir in the flour, salt, and pepper. Whisk until the flour mixture contains no lumps. Whisk in rice milk, and cook for about 5 minutes. Stir vegan cheddar cheese and ricotta cheese (if using) into white the sauce and stir continuously until melted. Spray casserole dish with nonstick spray. Add macaroni and pour cheese sauce over it. Stir to combine. Make crumb topping by combining the bread crumbs and melted butter in a bowl. Mix well so all bread crumbs are covered in butter. Add the vegan cheese and stir again. Crumble over the casserole. Bake the casserole at 375 for about 20 minutes until the topping is browned. Growing up in the Midwest, we ate Sloppy Joe’s a lot! They were one of my favorite sandwiches and my mom made them a lot, especially for parties and potlucks and they were always a hit! My mom handed down here Sloppy Joe’s recipe and we still make them all the time except now we make them vegan. They’re still a hit at potlucks and much healthier than the meatier version! They can be made with either Gardein Beefless Crumbles or lentils depending on your taste. And, you can make these vegan Sloppy Joe’s in a crockpot to take a long with you, just make sure to keep it on low so the sauce doesn’t burn! Eat them on a bun with vegan mayo and pickles or topped with vegan coleslaw! If using lentils, cook according to package directions. Meanwhile, combine all ingredients except crumbles or lentils in a large pan and simmer until thickened 10-15 minutes. Add Gardein crumbles or cooked lentils to sauce and mix well. Cook a 5-10 additional minutes if using Gardein Beefless Crumbles to warm them. 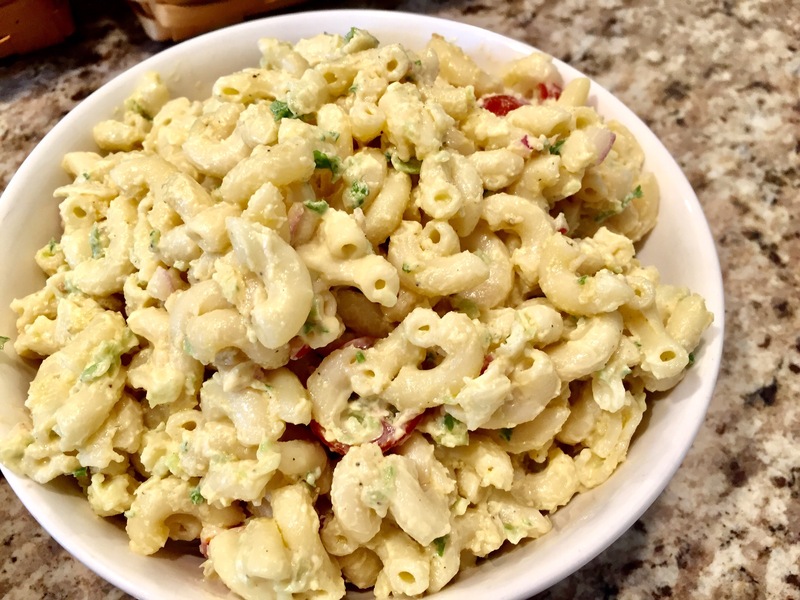 Macaroni salad is one of my family’s favorite Summer side dishes. And luckily, it’s easily made vegan by using vegan mayo such as Follow Your Heart’s Veganaise or Hampton Creek’s Just Mayo in place of traditional mayo. I made it for our Father’s Day picnic today and it was a hit with my whole family. 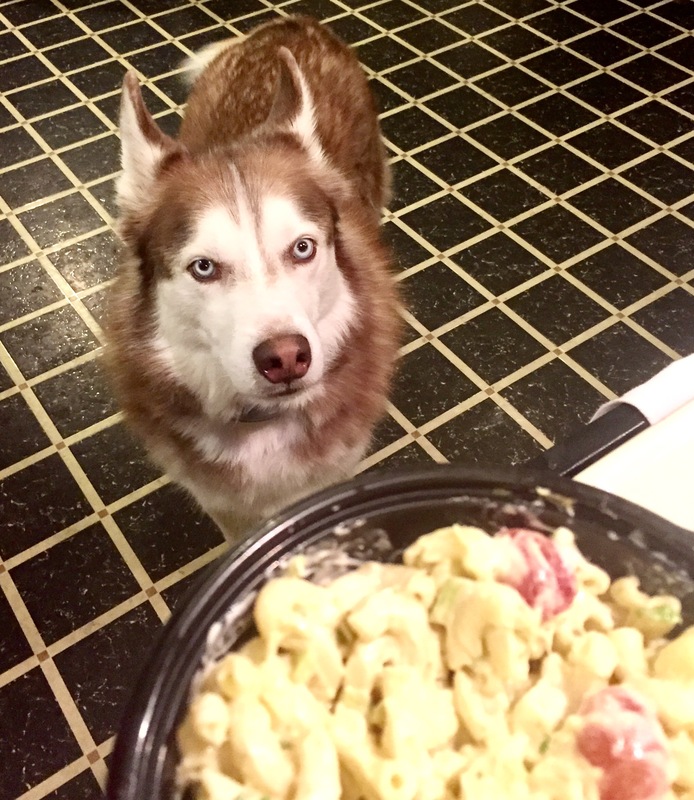 Both of my huskys love it as well, Baron even assisted in the making by being my official taste tester. They even got their own set aside without onions. Whisk first 6 ingredients together in large bowl until well combined. Add remaining ingredients and stir to combine. Refrigerate for at least 1/2 an hour before serving.